Long known affectionately as the Silver Bough, the apple tree holds a special place within myth and folklore as a tree of great worth and repute. Legends featuring the apple are a part of many different cultures, ranging from the ancient Greeks and Romans right across the world to the Norse and the Celts, and although these legends cover a diverse range of topics and stories, the apple is often to be found as a symbol of the Otherworld, of fey wisdom and intuition, and is usually associated with love, beauty and the Goddess. 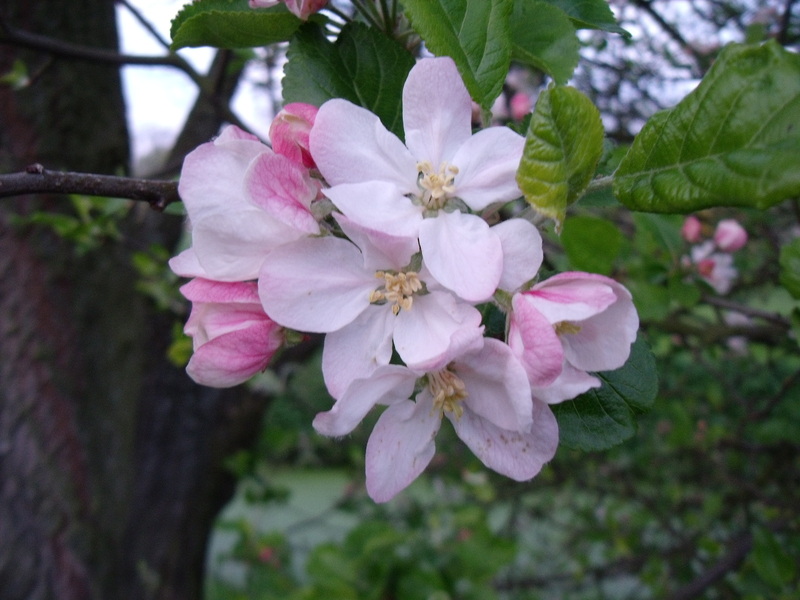 Crab apple flowers - how very pretty they are! As many of the different sets of myths and legends have no set date of origin, it is difficult to know exactly where to begin with recounting some of the many wonderful tales associated with this well loved fruit. As the author happens to be British, the sensible place to begin would seem to be with British and Celtic myths and legends, with the legends of King Arthur being perhaps the most obvious story to begin with. The apple tree already had a long association with the Summerlands when it became linked to the fabled Isle of Avalon, or Isle of Apples, the final resting place of the great King Arthur, taken there by the nine Morgans after his fateful death at the great battle of Camlann. Of course, this was not the first mention of the sacred apple in Celtic and British myths and legends – the tree is also mentioned several times in the Celtic tales of the Mabinogion, perhaps most notably at the beginning of the Voyage of King Bran the Blessed, who, when he fell asleep outside the gates of his citadel one morning as the result of ethereal music that only he could hear, was greeted on awakening by the sight of a beautiful silver branch laden with apples and white blossoms. He took the branch back into his hall, and when he did, an ethereal woman appeared in the centre of the room, and sang a haunting, fey song about the Otherworld. When the song finished, she vanished, taking the magical silver branch with her. Of course, this song lit a fire in the soul of King Bran, and nothing would please him then but to set sail on a long search for the Otherworld, also marking the beginning of a saga of many adventures, losses and hard won wisdom. 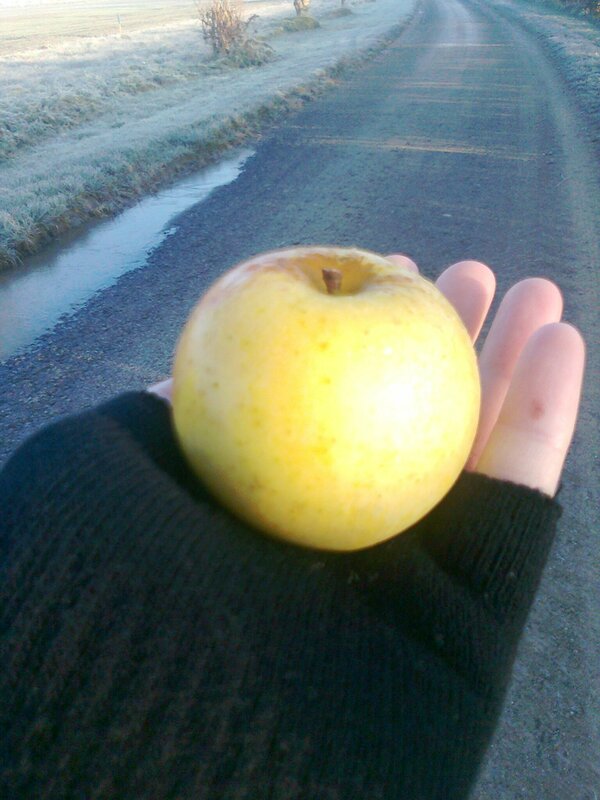 A small golden apple gathered near home, the first days after moving in to my cottage over 18 months ago. In the Irish myths and legends, the sea God Mannanan Mac Lir is reputed to live on an island known sometimes as Emhain Abhlach – the Place of Apples, another name for the fabled isle of Avalon. One day, the sea God appeared to Cormac Mac Airt whilst carrying a branch laden with nine musical golden apples. When shaken, the sound that these apples made was said to cure the troubles of any within earshot of the resulting music. In early Celtic Christianity, Saint Brighid caused apples and plums to grow on an Alder tree. Earlier still, some stories cite the apple as being the fruit offered to Eve by the serpent, causing both her and Adam to be cast out from Eden – although apparently the bible itself does not usually mention the apple at all in this particular creation legend.